Although the initial investment can be high, an outdoor wood furnace can eliminate your monthly heating bill. Have you always wanted a system that could effectively heat your entire house without the hassle of adding firewood in the middle of the night? Do you dread the thought of hauling firewood into your house, leaving wood chips and dirt everywhere? If this sounds appealing than this option might be a perfect choice. 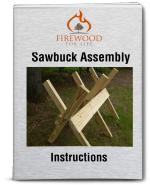 The wood furnace is placed outside your home near your firewood storage area. They consist of a firebox surrounded by a water jacket. The fire heats the water to a specific temperature (usually 180 degrees) which is automatically controlled by the unit. The heated water is pumped into your house through underground tubing using a circulation pump. 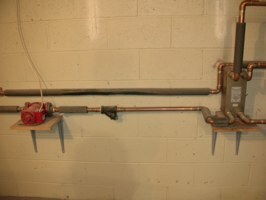 The tubing connects to a heat exchanger where the heat is transferred to your existing heating equipment. The heated water inside the wood furnace never mixes with your existing heating unit or domestic water. All of the heat is transferred through the heat exchanger. The furnace is located outside leaving the mess associated with burning wood outside your home. They are capable of burning large pieces of wood at various lengths. Depending on the outside temperature, the firebox is filled once or twice a day eliminating the need to constantly check the fire. The temperature in the house is still controlled by the existing thermostat controls. The household heating system functions just like it normally would, the only difference is you're burning wood, not an expensive alternative fuel. 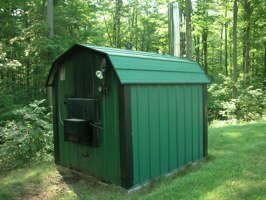 A wood furnace is also capable of heating an additional building or item. Most units have two outlets on the back. One to heat your home and another to heat an item of your choice. If you only need to heat your home you can simply close the other outlet off. The two outlets give you the option of heating a nearby barn, pool or hot tub. Heating your domestic hot water is also handled by the wood furnace. Just connect the line to another heat exchanger which will transfer the heat to your hot water tank. We currently use a sidearm heat exchanger to heat our domestic hot water. The sidearm heat exchanger supplies 100 percent of our hot water and our electric hot water heater is completely turned off! Buying An Outdoor Wood Furnace? Over the last 10 years the wood furnace has become very popular and they are now manufactured by a variety of different companies. The initial cost can be expensive, ranging on average from about $5000-$7000. Some units can be more or less. Depending on your current heating costs, this may take several years to recover your initial investment. Overall, heating with an outdoor wood furnace can supply your house with consistent heat that is relatively easy to maintain.